While testing a CM6631A interface, I discovered that for 44.1K/48K sample rate material, the bitclock was running at 128FS (rather than the more common 64FS). Thus when connected to a Sabre 32 DAC, it reported a sample rate of 88.1K/96K. I described the behavior as “2X bitclock” [link]. BLCK is the same for both 44/48K and 88/96K. This means that for 44/48K sample rate, the data is running at 128fs and for the rest of the sample rates, it is running at 64fs. Then you need the “Firmware update tool” to upload the s/w to the CM6631A-based interface. 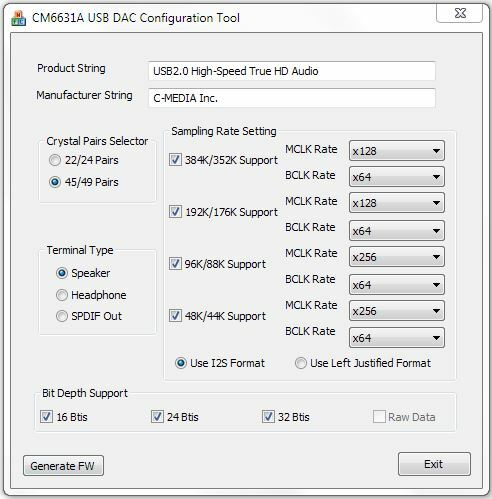 Once you update the FW with the x64 BCLK rate, the 44.1K/48K sample rate will correctly display in the Sabre32 DAC. The board has two I2S output is available. The diyer can flash the firmware and enable “Headphone I2S” (non-isolated) and “Speaker I2S” (isolated) if needed. I’m looking for the configuration tool of CM6631A, and I have known that it’s provided by Mr. tdtsai but now I couldn’t contact with him. Could you send me a copy of it? My E-mail is ry900814@hotmail.com. Thanks for your enthusiastic help! could you please email me this tool? 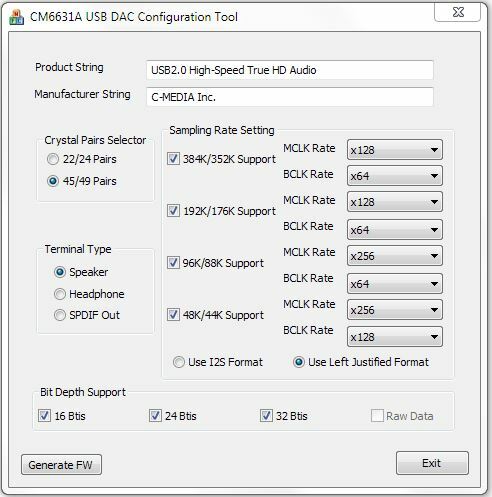 I have a CM6631A based PD04 DAC that doesn’t work at 176/192. Can I have the firmware configuration and update tools? I have also CM6631A based PD04 DAC. It is new with 1.01 firmware and plays only up to 96kHz, so 176/192kHz doesn’t work too. Did you Roberto find any solution? Hey there, are you around still?